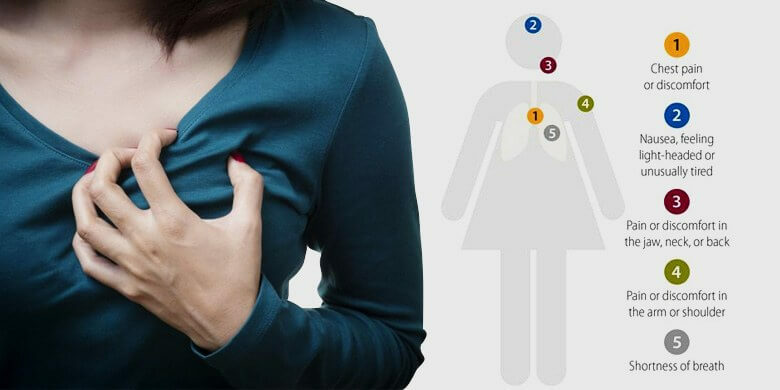 Do you know the exact signs of heart attack in women? If not, this article will give you very useful information. As pointed out by doctors and experts, through several research studies, heart diseases cause more deaths among women than breast cancer. It is, therefore, a matter of great importance that you should be able to recognize the warning signs of heart attack in women. The following discussion explains different typical physical as well as behavioral signs of heart attack in women. There are several typical signs which indicate an upcoming heart attack. On the other hand, certain symptoms occur less commonly but you can still consider them as warning signs. Through these physical signals, a woman can identify her own condition and seek timely medical help. Similarly, reporting these symptoms to a doctor can also help him or her perform the right diagnosis. Women should consider it a warning if they experience any one or more of the following symptoms. One of the typical symptoms of heart attack, chest discomfort can be experienced in several different ways. You can feel it as a squeezing sensation, intense pressure or severe pain. However, according to the American College of Cardiology, around 40% of women suffering from a heart attack do not feel chest discomfort at all. Therefore, if there is no chest pain but any of the following symptoms strikes, it is still a matter of serious concern. Women commonly complain about digestive discomfort during a heart attack. Dr. Charles Chambers – is Director at the Cardiac Catheterization Lab, Hershy Heart and Vascular Institute, Penn State. According to him, more women are likely to experience this common symptom as compared to men. Therefore, look out for signs like stomach pain, heartburn and indigestion. Nausea and vomiting are also among the early signs of heart attack in women. As the heart faces trouble pumping blood and sufficient oxygen to the brain, the feeling of lightheadedness is common. It should be particularly taken into account if the symptom strikes all of a sudden. In addition, if it occurs along with other typical signs, such as chest pain or shortness of breath, it is time to rush to the doctor. Chest discomfort often radiates to other parts of the body as well. It typically spreads upwards to the neck, shoulders, jaws as well as the arms. Generally, women are less likely than men to experience chest discomfort. However, they are more likely to feel pain in the arms, neck and jaws. It may even feel like a throat discomfort. Therefore, women should be aware about the fact that a simple arm pain can actually turn out to be a serious heart attack! It is normal to feel tired at the end of the day. However, if you have been feeling extreme tiredness without much exertion, it is time to seek medical help. Fatigue occurs due to a heart attack. It is when the organ fails to pump sufficient blood around the body. As a result, body cells do not receive enough oxygen and nutrients to be able to perform everyday tasks. Therefore, you may feel too tired to do your everyday chores. So, it can be one of the important signs of heart attack in women. Shortness of breath is also the result of the body being unable to receive sufficient oxygen through the blood. It may occur without any physical exertion. Therefore, it is a definite warning sign. Particularly if it occurs along with any of the above mentioned signs of heart attack in women. A cough can be a sign of several issues of the respiratory system. Mostly, doctors do not regard it as a warning sign. However, if you’ve had a persistent cough for quite some time, it is a matter of concern. In particular, women with a history of heart diseases should pay special attention if they cough up pinkish mucous. This is an indication of blood leaking up to the lungs when the heart fails to pump blood properly. Another sign which indicates the ineffectiveness of the heart’s pumping job is swollen feet and ankles. This occurs as the blood accumulates in the veins due to poor circulation. As a result, bloating occurs. A racing heart is normal if you have just been through some physical exertion. However, if it happens while you are in a state of rest, it should be reported to the doctor. Irregular heartbeat is one of the common signs of heart attack in men and women alike. Women need to seek help if the irregularity persists for more than a few second and increases in frequency. All the discomfort due to the above mentioned symptoms can lead to sleep disturbance. If you have been facing trouble falling asleep or staying asleep along with the other warning signs, you should seek a doctor’s help. Betty Crocker mentions it in her famous Betty Crocker Cookbook that women fail to identify their own personal risk of heart attack. As a result, they are more likely to ignore the early warning signs of heart attack in women. On the other hand, others can identify the behavioral signs being exhibited by women and help them seek timely help. It may be the mother, spouse or a friend. Pay attention if any of the following behavioral signs are appearing. 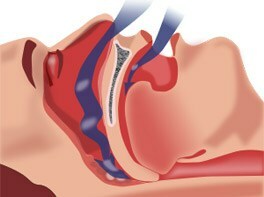 Snoring is a matter of concern if it is particularly loud and sounds more like choking or gasping for breath. This is an indication of sleep apnea which in turn may reveal stress in heart. Therefore, if your mother, spouse or friend has been exhibiting this pattern of snoring, help them consult a doctor for checkup. If a dear one at home or a female colleague at work has been showing signs of unusual exhaustion, it is time to show concern. Victims of an impending heart attack feel too tired to perform even the simplest jobs. Breathlessness appearing without any strenuous exertion may be an indication of a malfunctioning heart. Therefore, if your female partner or friend has been short of breath despite being in a state of rest, you should call the paramedics. It is one of the less common signs of a heart attack in women. However, breaking out sweat without physical exertion or a high external temperature is certainly a matter of concern. This type of mood changes has nothing to do with the common symptoms of PMS. Usually, women who are at the verge of a heart attack exhibit feelings of anxiety. They look stressed and anxious without any apparent reason. Therefore, if you notice this behavioral change in your spouse, mother, colleague or friend, do show concern instead of taking it lightly. Identifying the common physical and behavioral signs of heart attack can help women and their companions seek medical help in time. It is better to know when to call the paramedics instead of ignoring the symptoms.